The following description refers to the 1200 dpi dual print head technology used in a printing unit. In the past, multiple IJ heads were arranged in a line for high-density mounting of nozzles along the width of the sheet (in-line heads). Printed images sometimes had discontinuity at the joint between the heads, resulting in unevenness. Ricoh's original head technology, bi-pitch laminated piezo actuator, has enabled precise, stable control of discharge from an IJ head. The technology is suitable for in-line arrangement, and is effective for improving the unevenness resulting from the discontinuity of an image at the joint between the heads. The bi-pitch laminated piezo actuator is installed in a stainless-steel head, developed in-house. It enables precise, stable control of ink discharge, even when the viscosity is high. 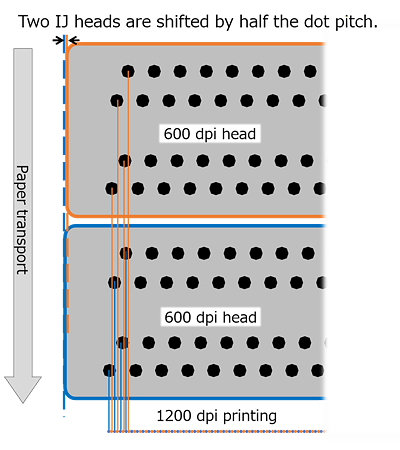 In the RICOH Pro VC60000, two 600 dpi heads are combined to comprise a 1200 dpi print head module. Two print heads, shifted by half the dot pitch, are installed in a single housing. The head module is capable of printing at 1200 dpi in a single pass. 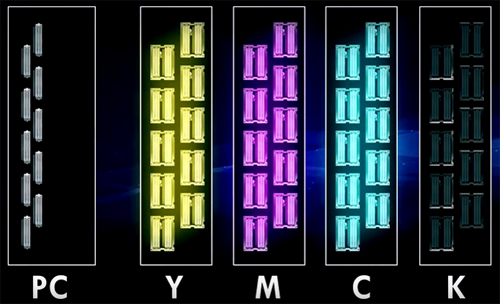 For each color, the print head station consists of ten 1200 dpi print head modules arranged in a line. Two-inch print heads are staggered along the nozzle array to enable printing on sheets up to 20.5 inches wide. Ricoh's original head technology is featured in stainless-steel heads, which are arranged in a line. This configuration improves the unevenness in an image at a joint between the heads, enabling a wide range of printing schemes from fast printing to high-quality printing.